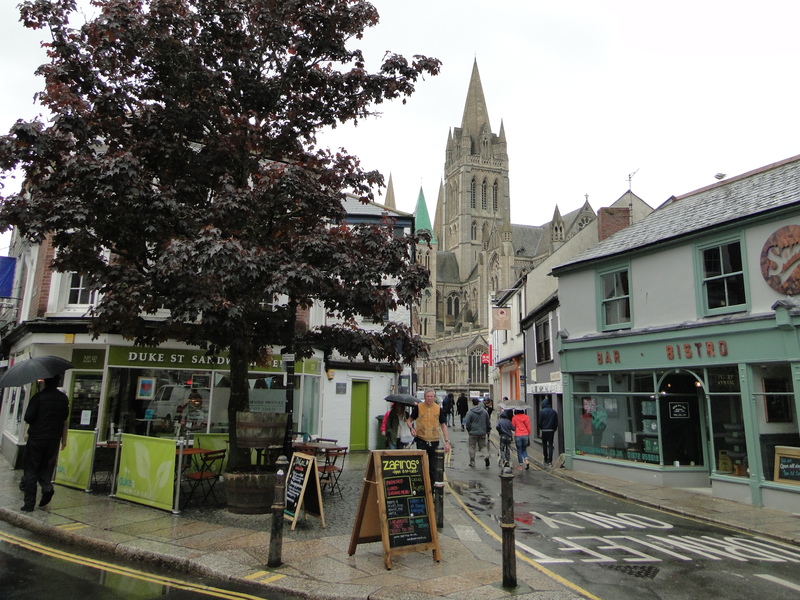 Truro was not particularly lively first thing on a Bank Holiday Monday (26 May), but we found a little cafe in Duke Street. We went into Waterstone’s and I found a book about Agatha Christie’s houses which I sat and read while J perused the whole of the rest of the stock. Then WHSmiths – another brush with the self-service tills (am I the only one who hates them?). 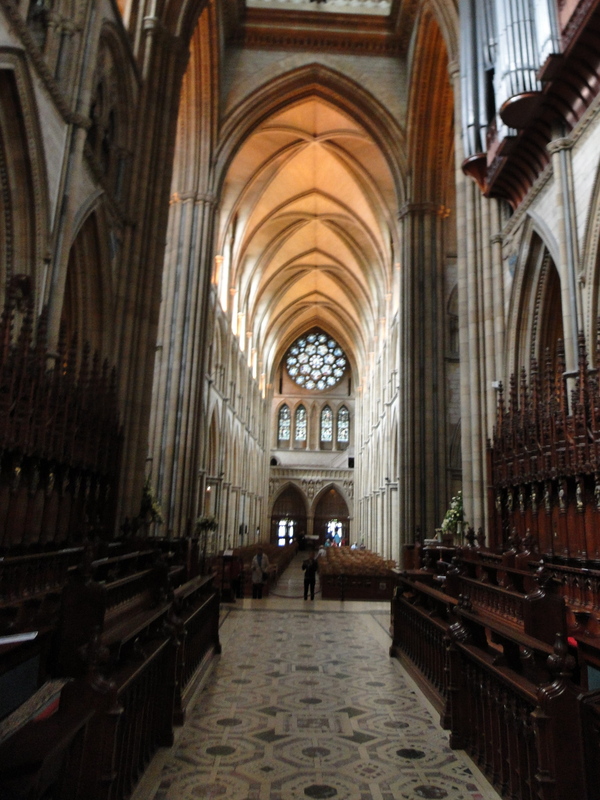 We sought calm in Truro Cathedral – the Cathedral Church of the Blessed Virgin Mary. 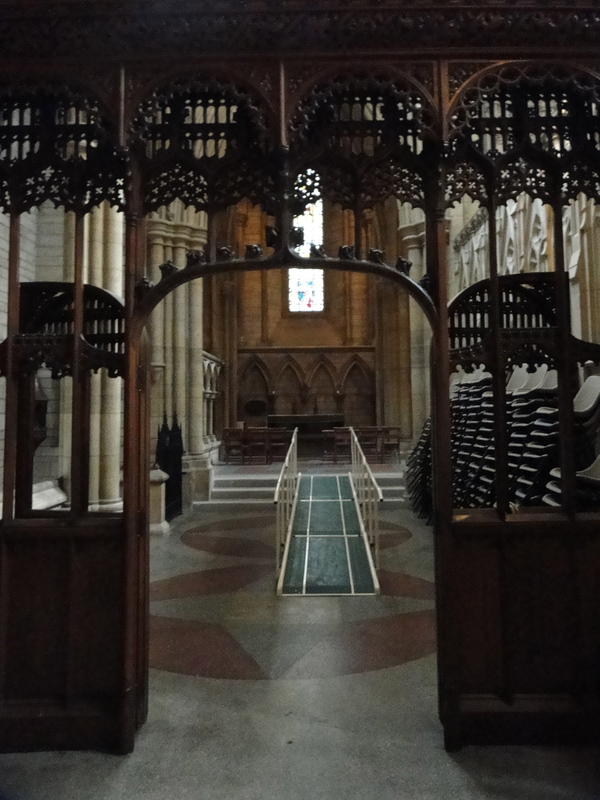 It was a wet day and disabled access is temporary through the West Door – a bit of a stiff push, but a nice welcome as the door was held open for us. “Would you like a guidebook for £3?” was the next question – and it is a very nice guidebook (it also has a voucher for 10% off in the Refectory – clever move). 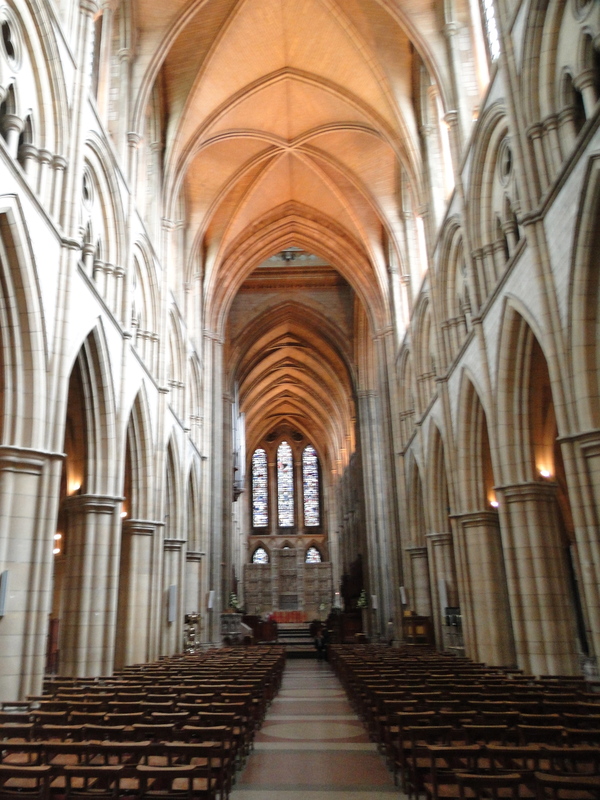 The Cathedral is Victorian. 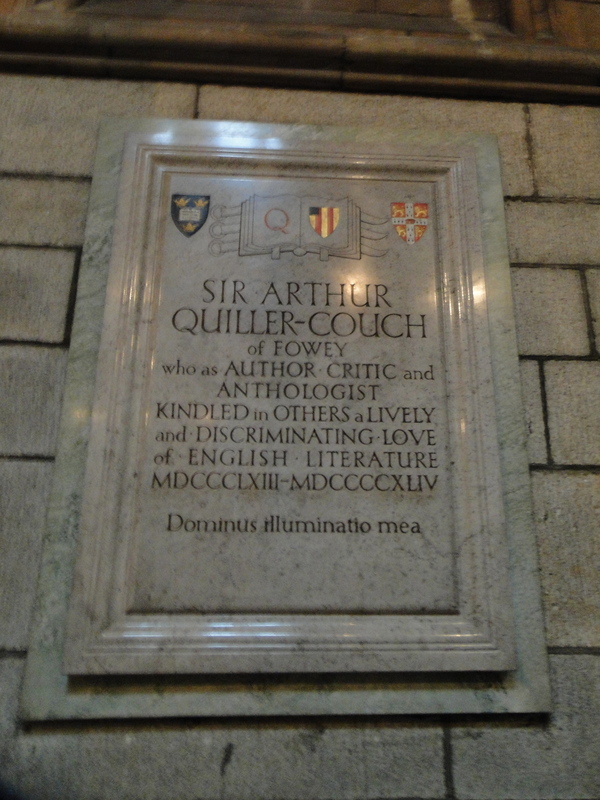 The foundation stone was laid on 20 May 1880 by Edward, Duke of Cornwall (later Edward VII). It was designed by John Loughborough Pearson, who wanted to bring people to their knees. 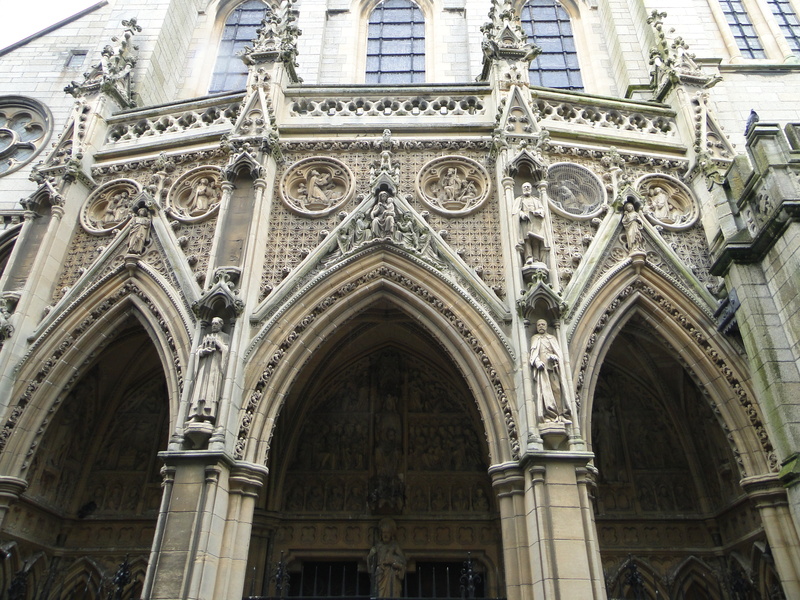 He used the Gothic style and the majority of the work was completed by 1910. 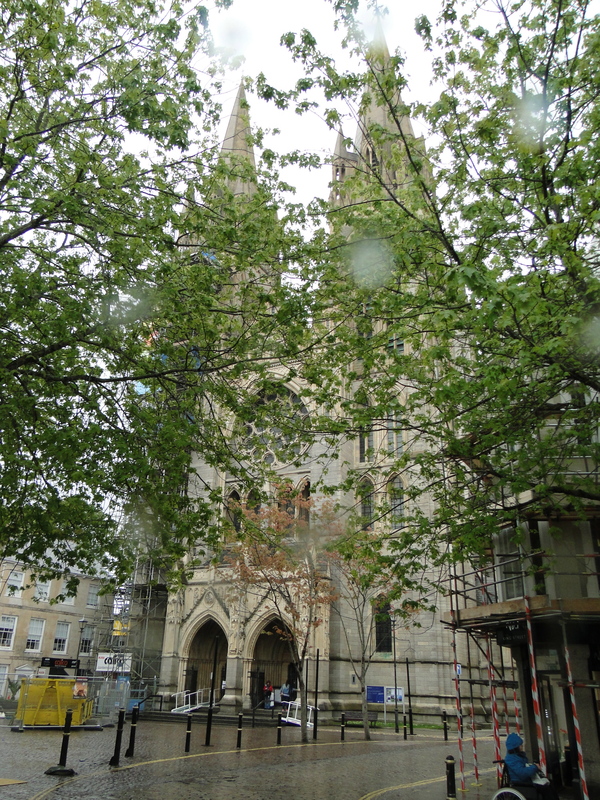 It was built of local Cornish granite, with decorative features carved in Bath stone. Your eye is taken heavenward. 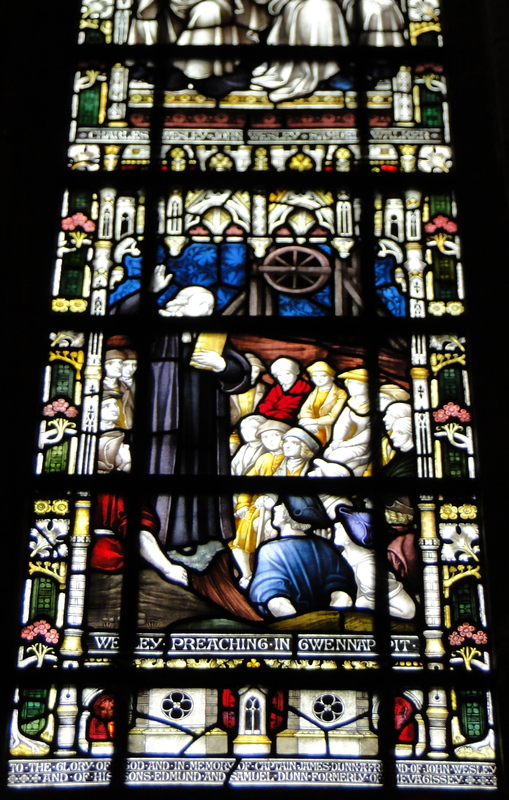 Lovely stained glass – John Wesley preaching in Gwennap Pit, and a window with Thomas More, Dean Colet and Erasmus – were they ever together? 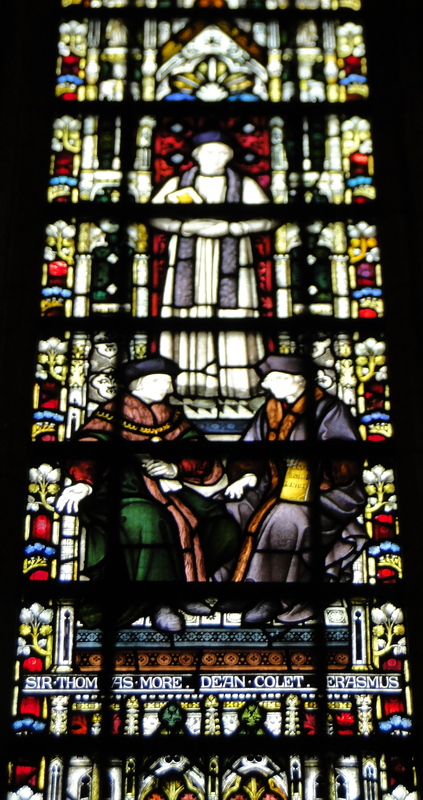 Yes, Colet was tutor to More, Erasmus and Tyndale. 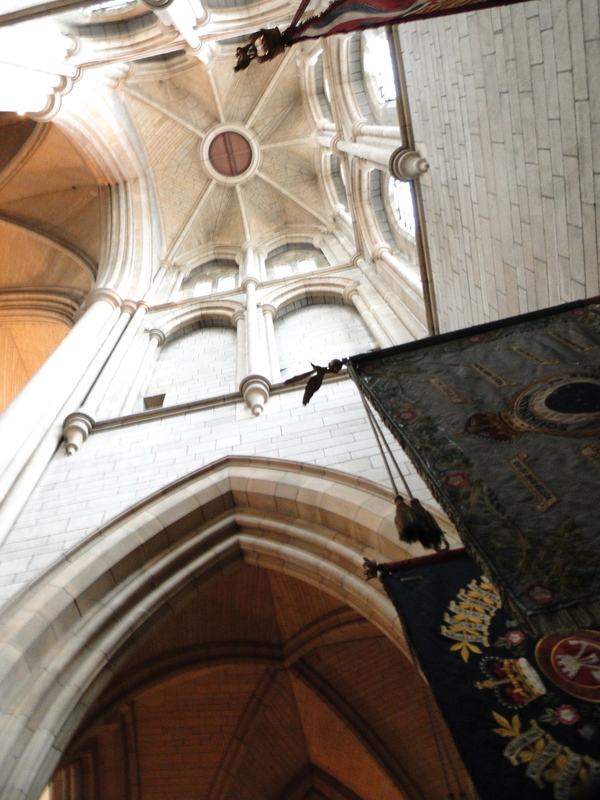 Looking up into the SW tower, and the Boer War memorial (which commemorates lives lost by the Duke of Cornwall Light Infantry and others). 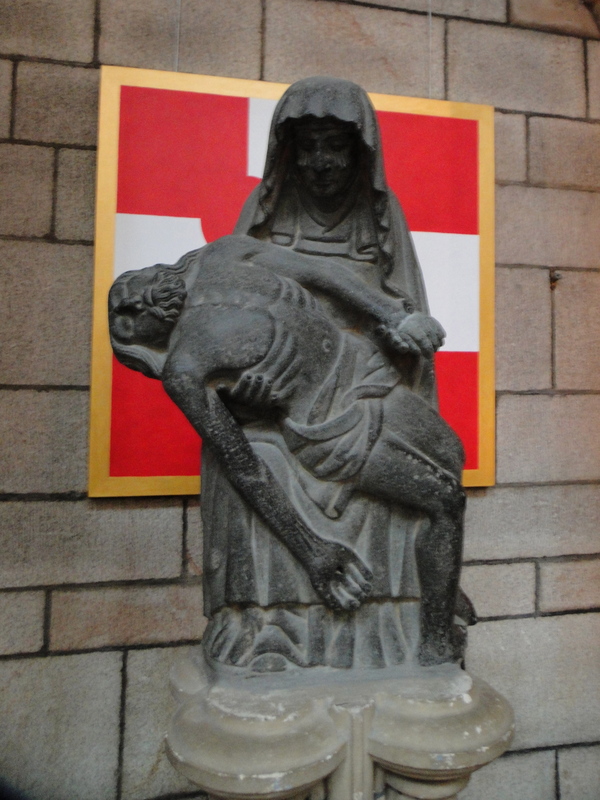 This Pieta was carved by Breton monks in the C14 from Caen granite and was a gift to the Cathedral. 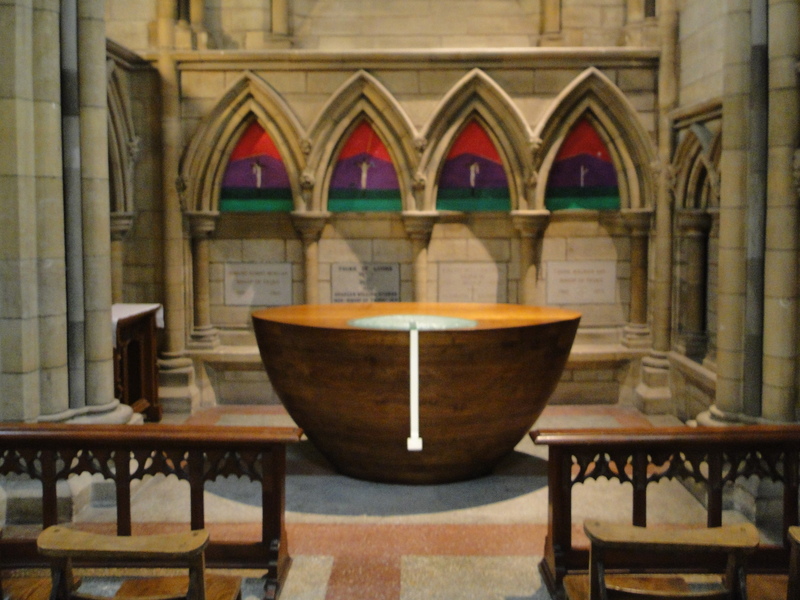 The Baptistry – and the guidebook tells us what it is and what it is used for (I’ll assume readers of northernvicar know) – is a Pearson work, The red stone is Breccia marble from North Africa, the green stone is Serpentine rock from The Lizard. 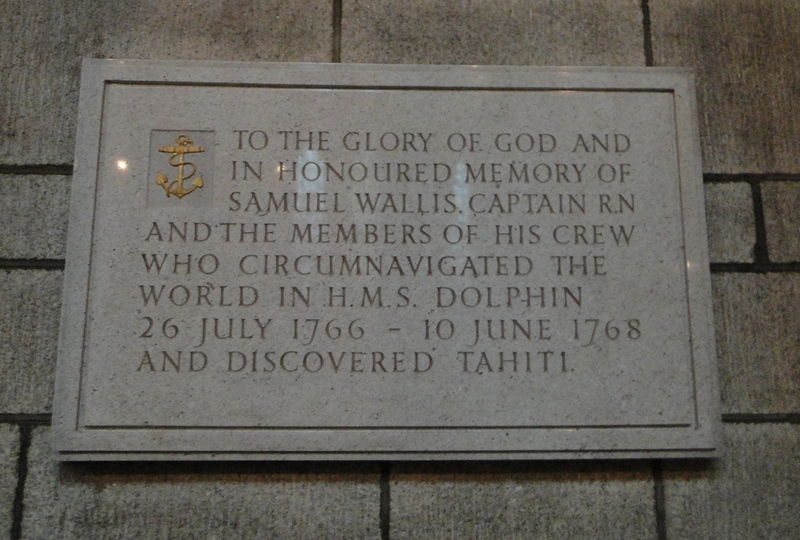 The Baptistry is dedicated to Henry Martyn, a native of Truro who was a missionary in India and Persia. 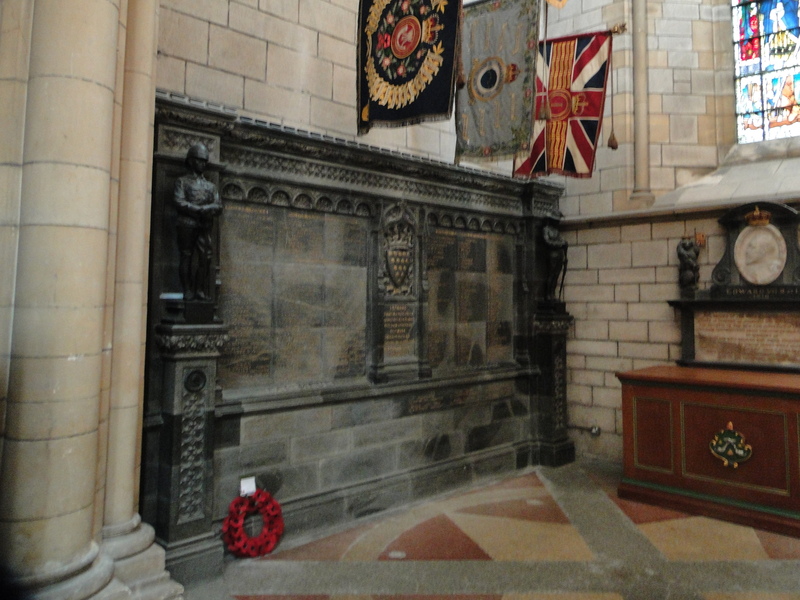 In the South Transept there is a memorial brass to Edward White Benson, Bishop of Truro – it was under the, rather stunning, Easter Garden. 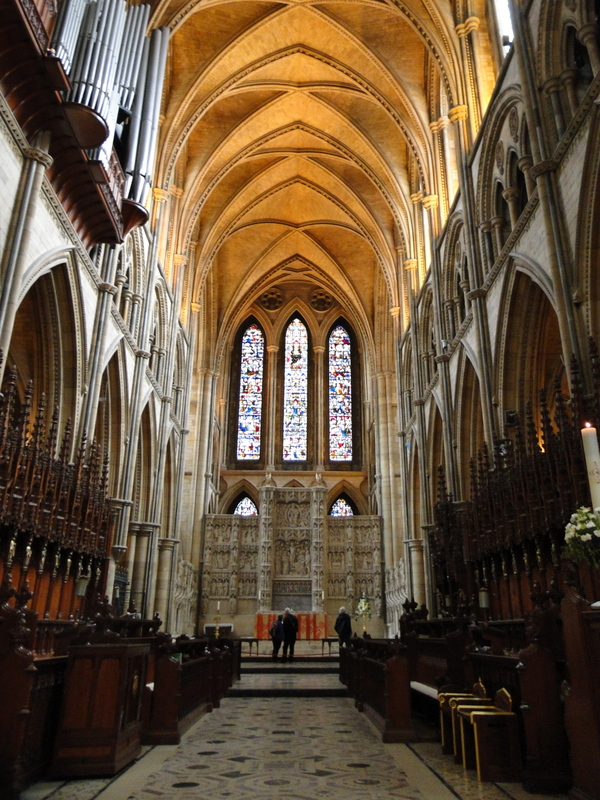 SE of the Chancel is St Mary’s Aisle – St Mary’s church has stood here since 1259 and was incorporated in the Cathedral. They didn’t incorporate disabled access! 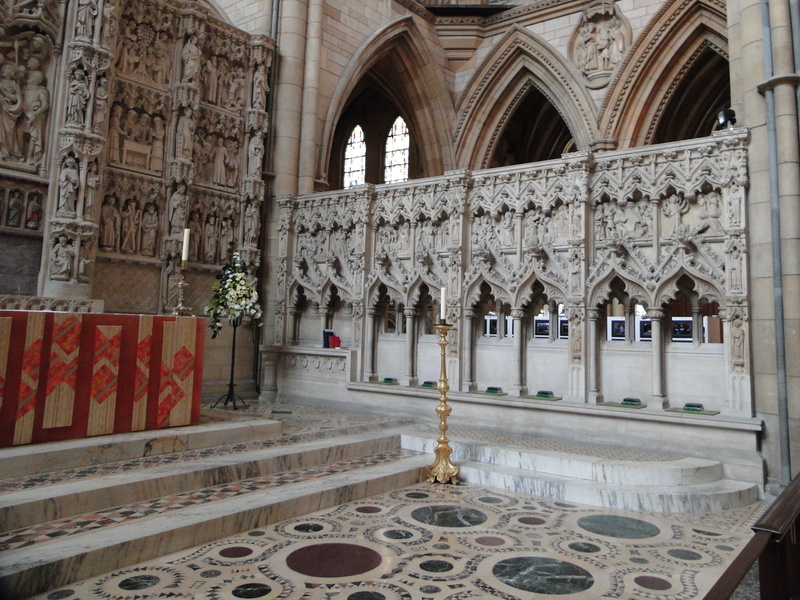 In the Retroquire, the area behind the High Altar, are some other chapels. 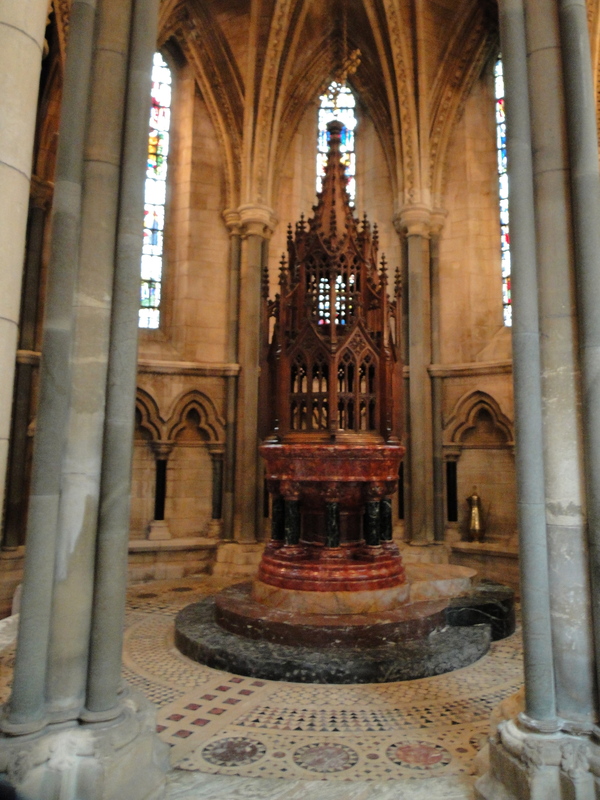 In St Margaret’s Chapel the altar was constructed from fumed chestnut (but the guide does not say who designed it). 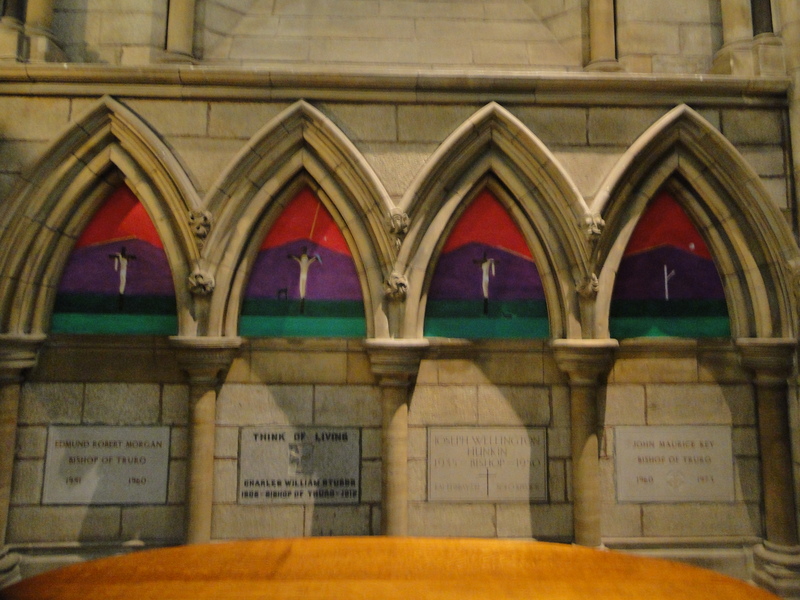 The paintings are by Craigie Aitchison, a Scottish painter and Royal Academician – these show the crucifixion. 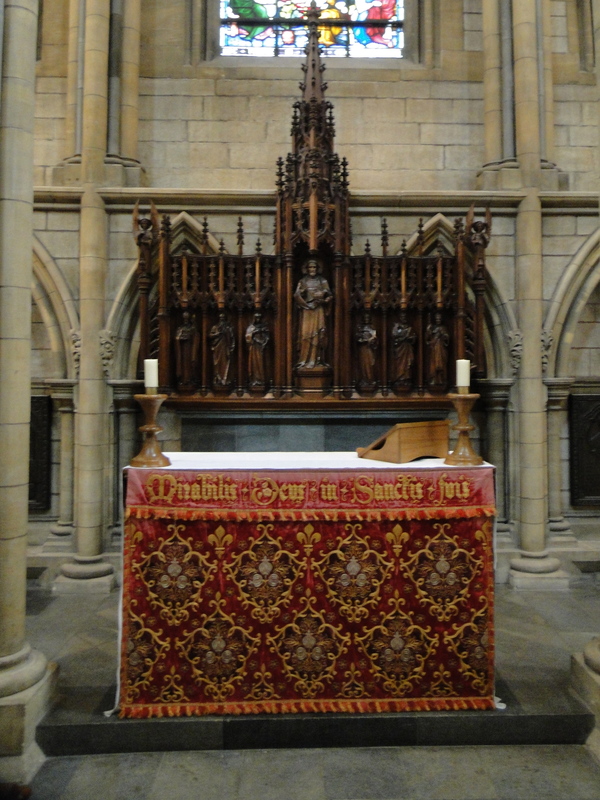 All Saints Chapel has a wonderful oak reredos. There is a mega disabled ramp. 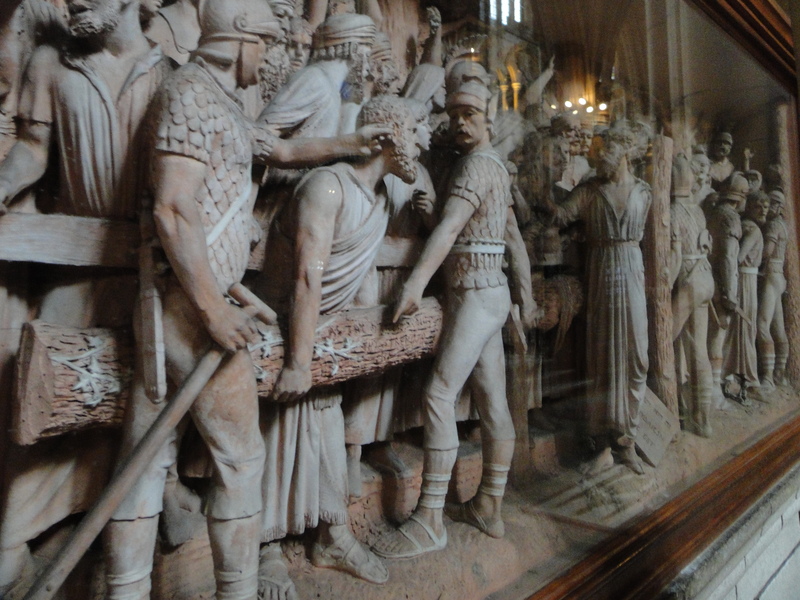 In the North Choir Aisle is George Tinworth’s large terracotta frieze The Way of the Cross. 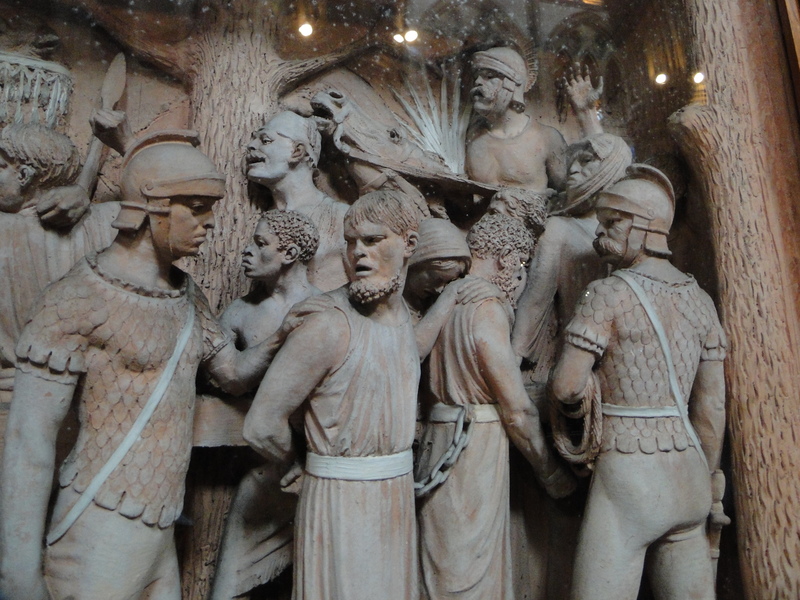 he worked for Doulton’s China Co., and this piece was exhibited in 1880. 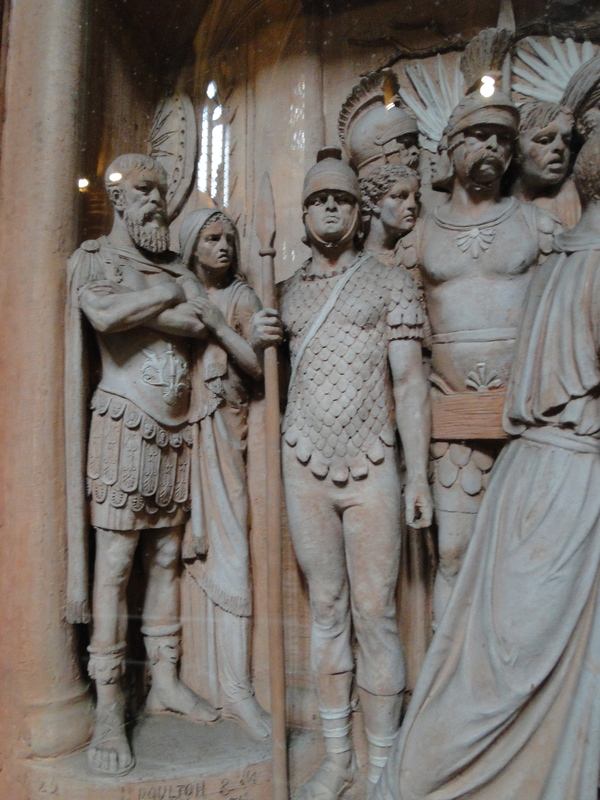 The face of Pontius Pilate bears a stunning likeness to the Prince of Wales, and the horse rider is General Gordon. 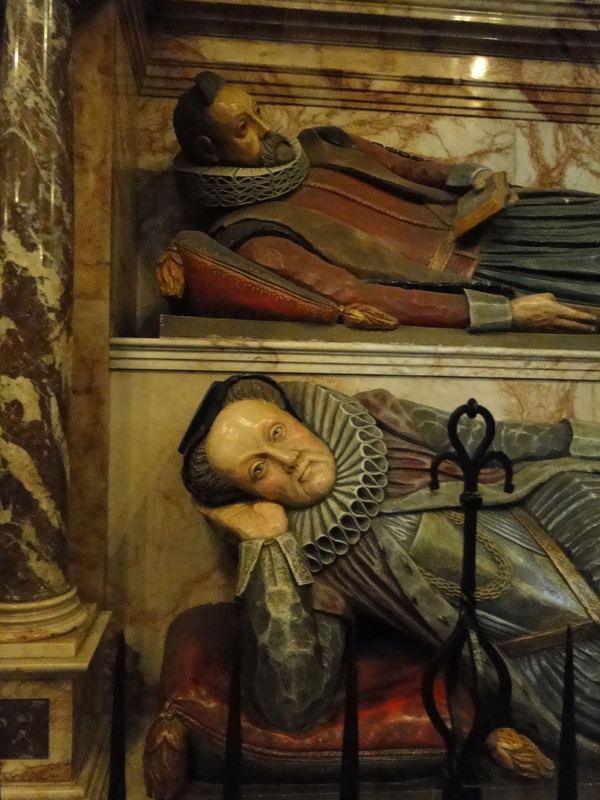 At this point we had lunch – this is a Cathedral that needs time. A very good lunch. Back to work! 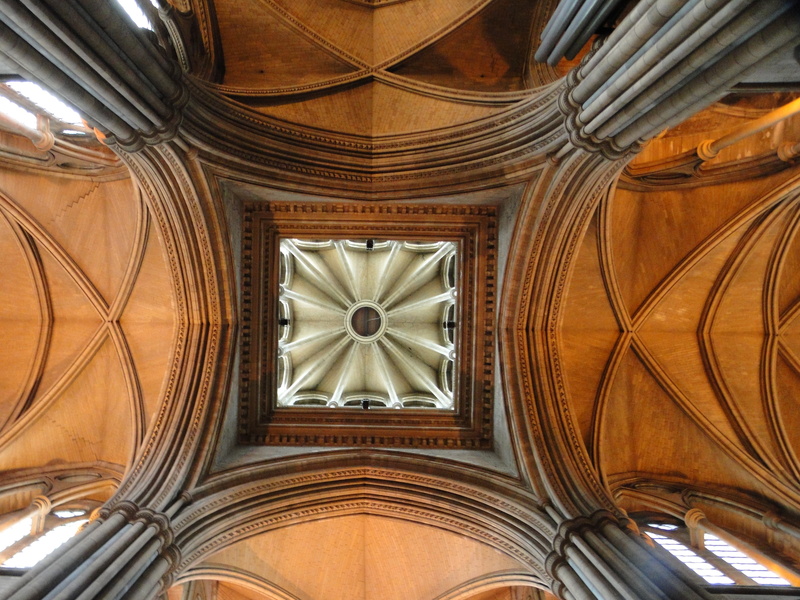 Let us stand in the crossing and look up. 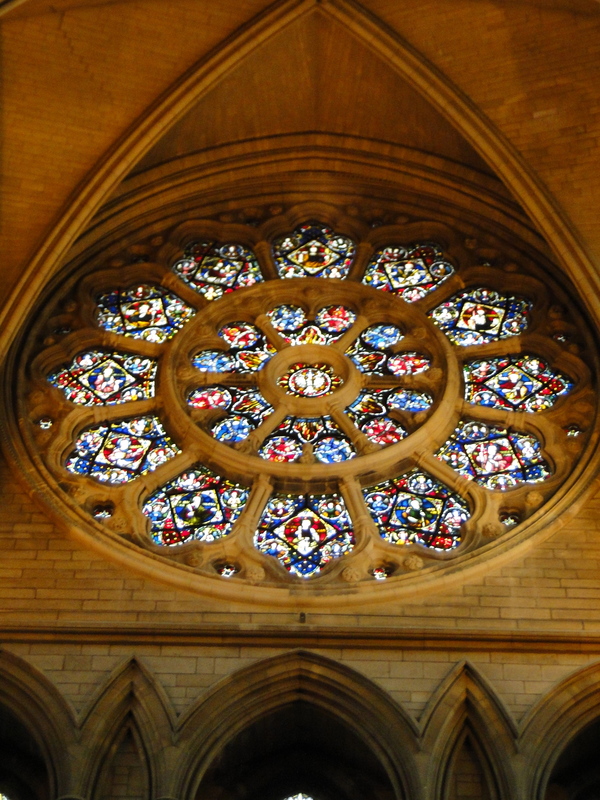 Then the Transept windows – like the rest it is Clayton and Bell. I only managed a decent photo of one of them. 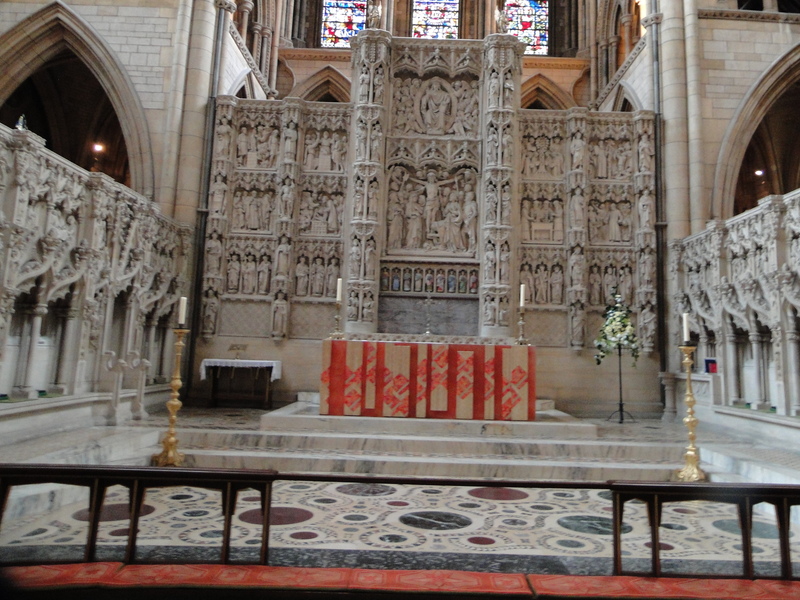 This is the view of the Quire, and an amazing High Altar. 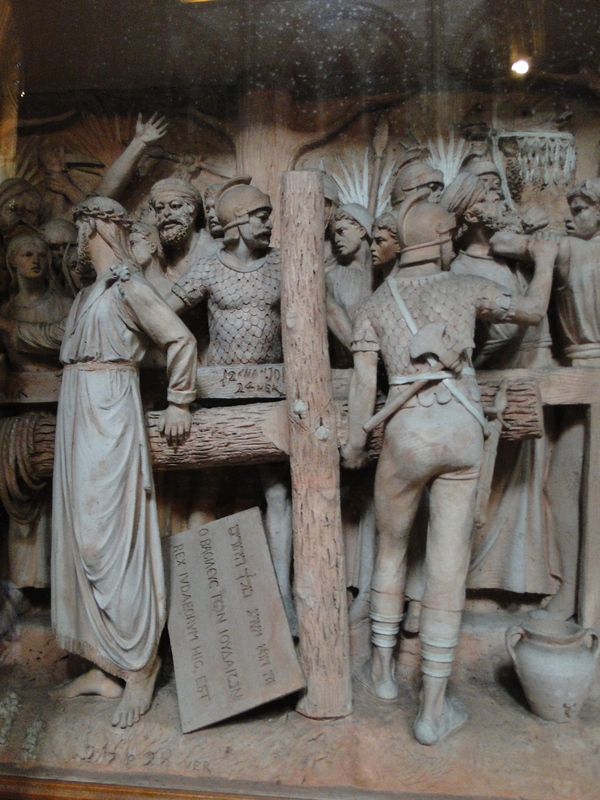 The Quire stalls are made of Burmese Teak (imagine getting an import licence for that these days). 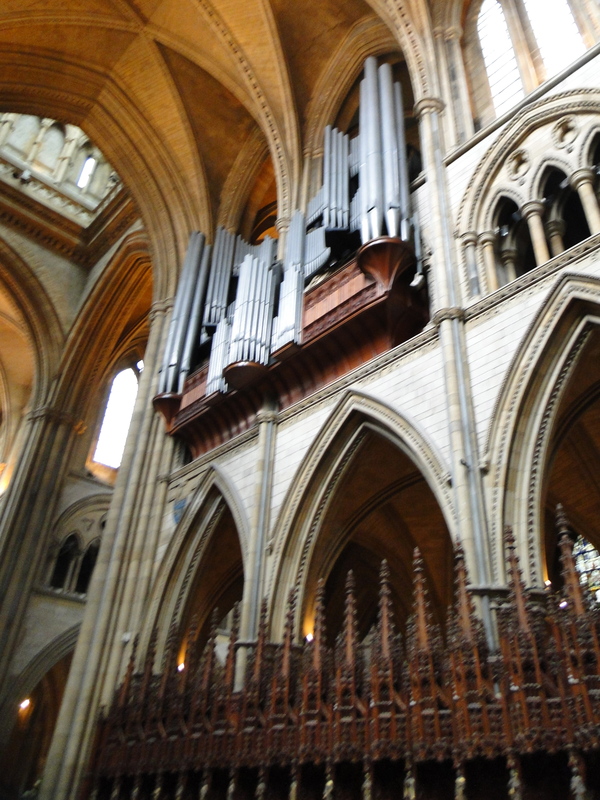 It’s a Father Willis organ – the guide says that it can be heard on Fridays during the summer (presumably it’s never used on a Sunday!!). 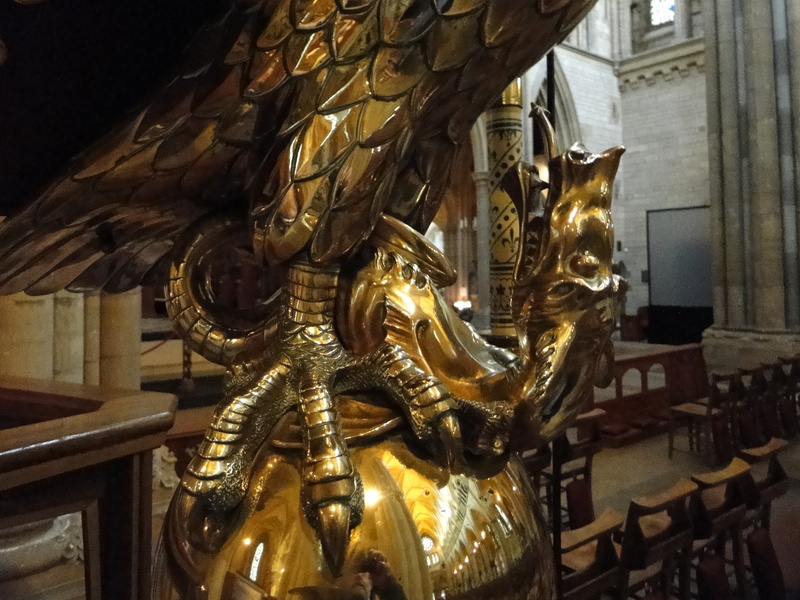 I have seen many eagle lecterns, but never one with a dragon under its claws. 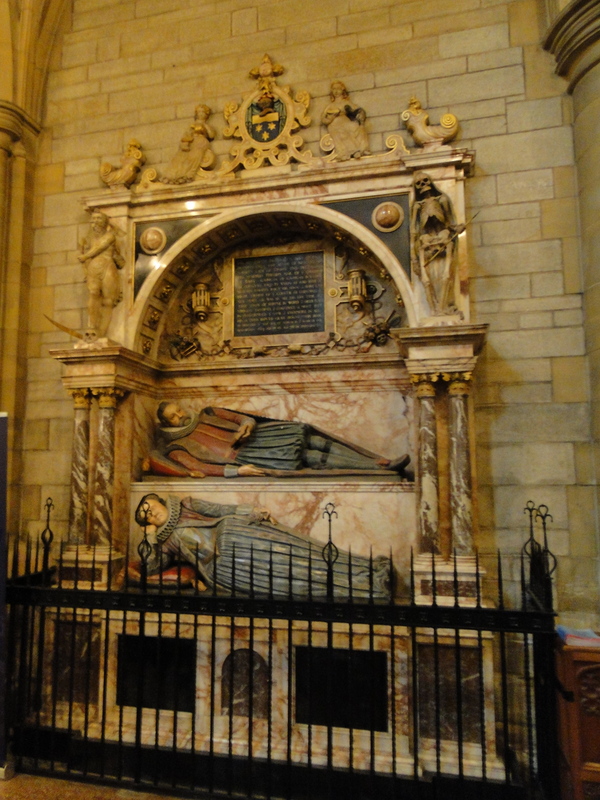 In the North Transept is a C17 memorial (moved from St Mary’s church) to John and Philipa Robartes – he was a successful Truro merchant, making the family fortune in tin. 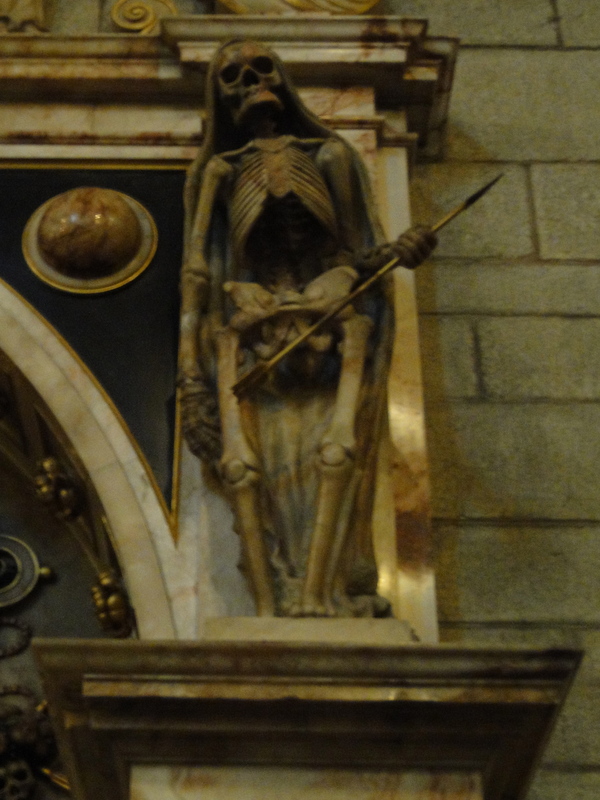 Plenty of reminders of mortality! I have always loved this picture – I remember buying a large postcard of it when we visited as a family, round about 1991 I think. 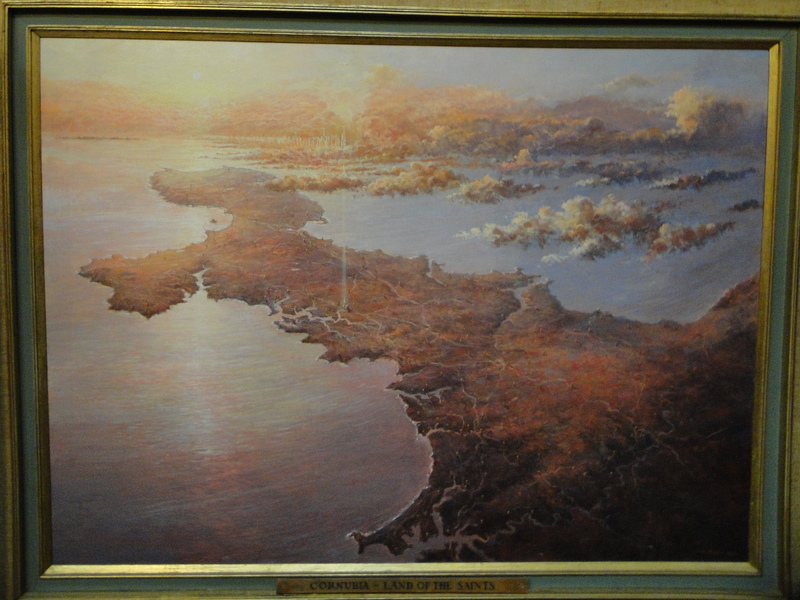 Cornubia – The Land of the Saints, by John Miller, an aerial view of Cornwall with the sun setting in the west. Celtic saints are crossing from Ireland, Wales and Brittany, bringing the light of the Gospel and the Holy Spirit to Cornwall. 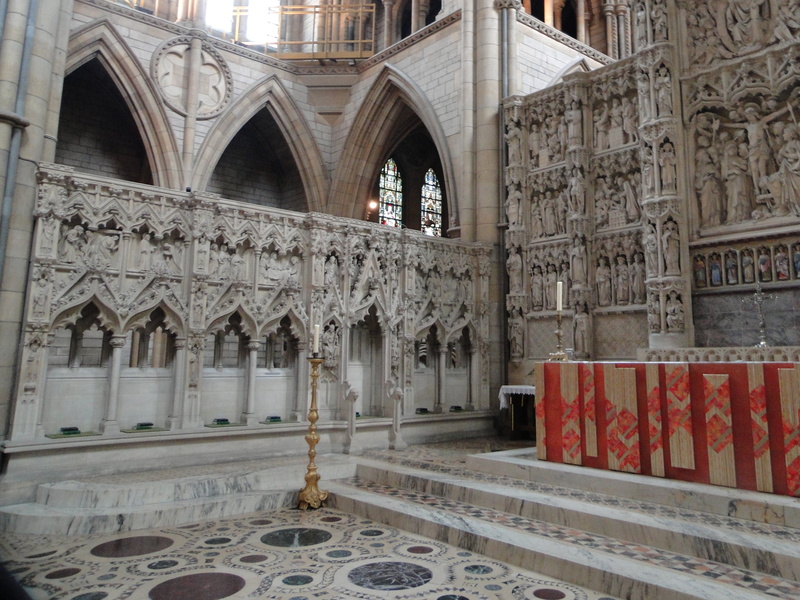 The Celtic crosses on the painting represent the parish churches of Cornwall. 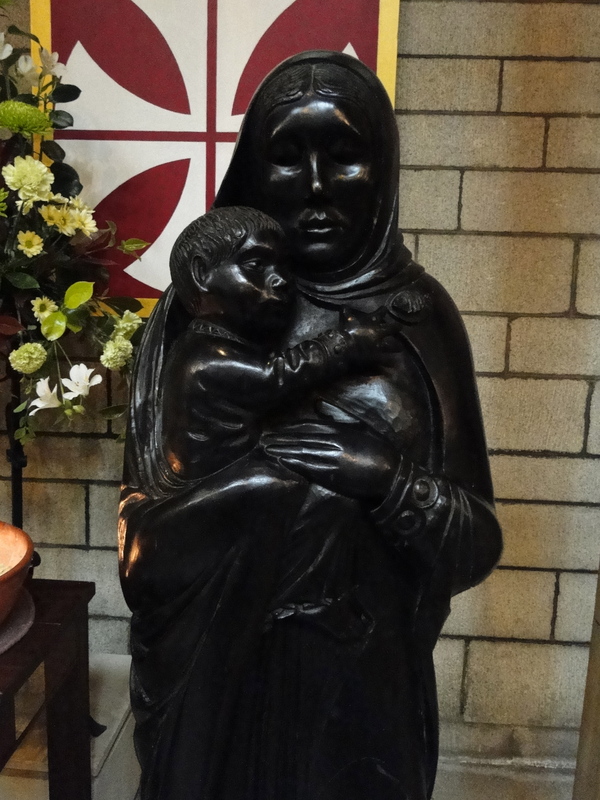 Another Madonna and Child, this one in black ebony, and a selection of memorial plaques. 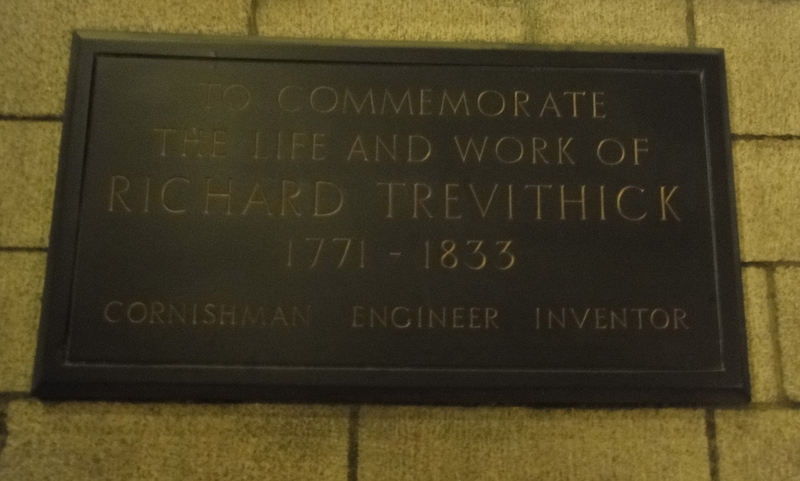 Another railway themed window, and a great Cornish inventor. 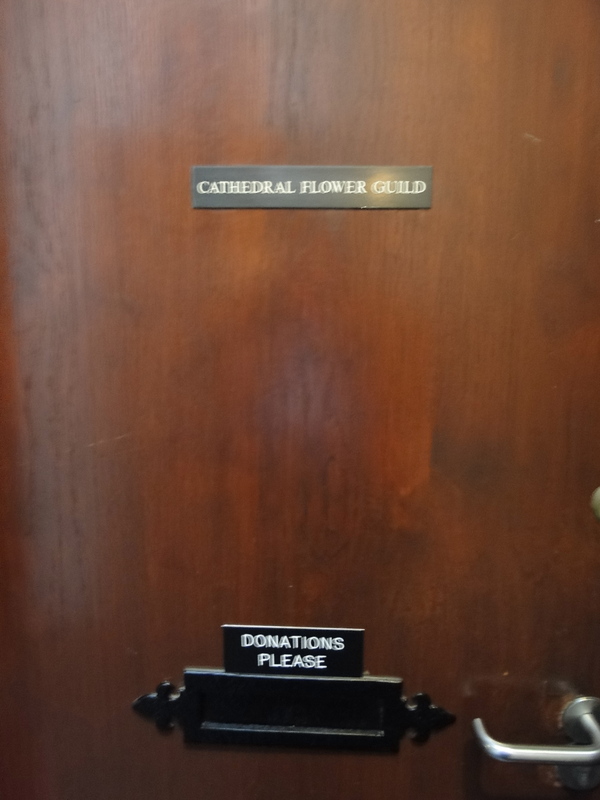 I wondered what donations one should leave for flower arrangers? 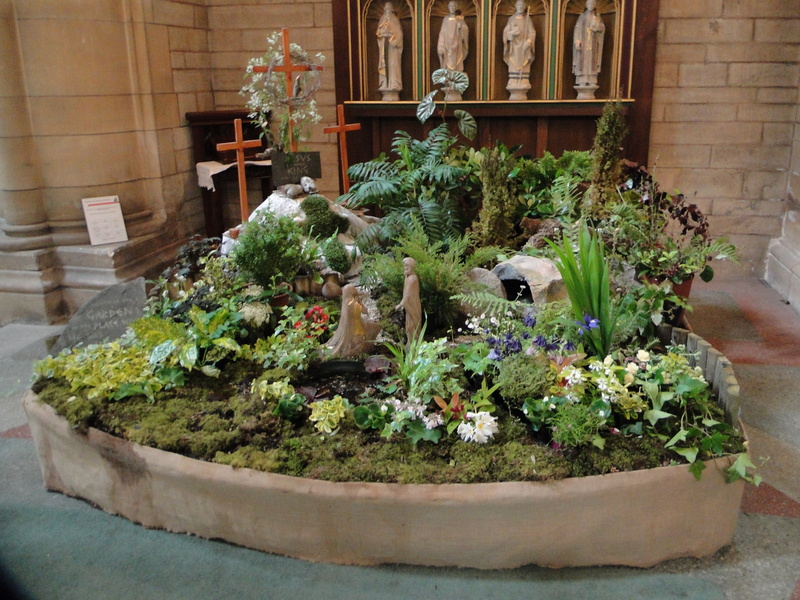 An arrangement of foliage, a pile of oasis? What is the difference between a flower arranger and a terrorist? ANSWER You can negotiate with a terrorist. Outside it was still wet – so my exterior photos are not brilliant. 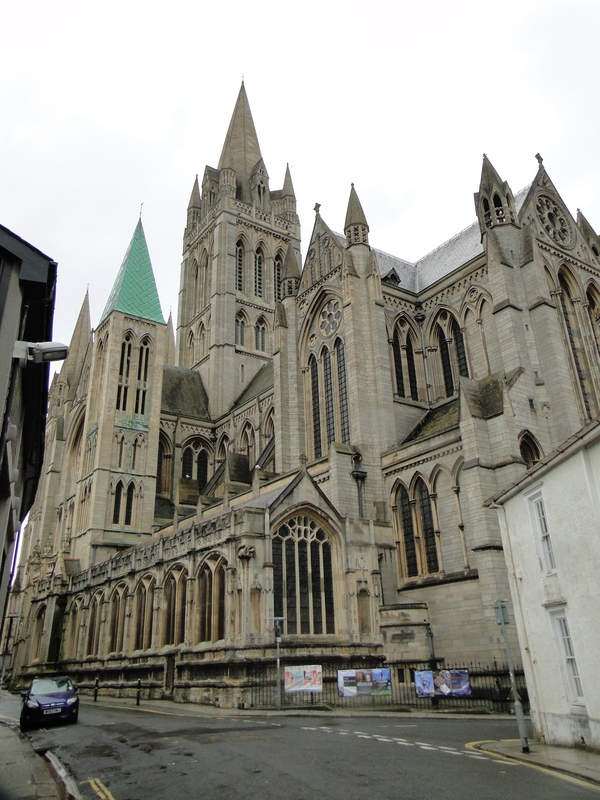 We liked Truro. 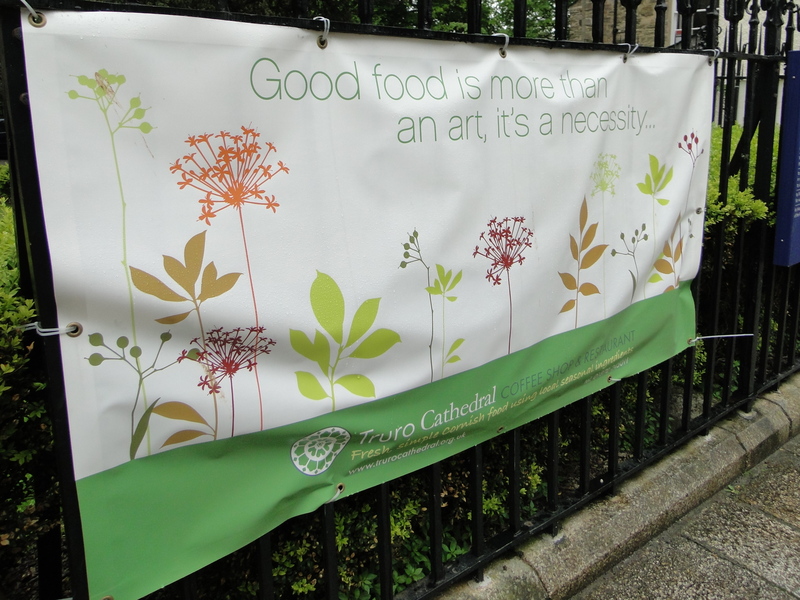 A beautiful building, a lovely welcome, good nosh, a spiritual place. 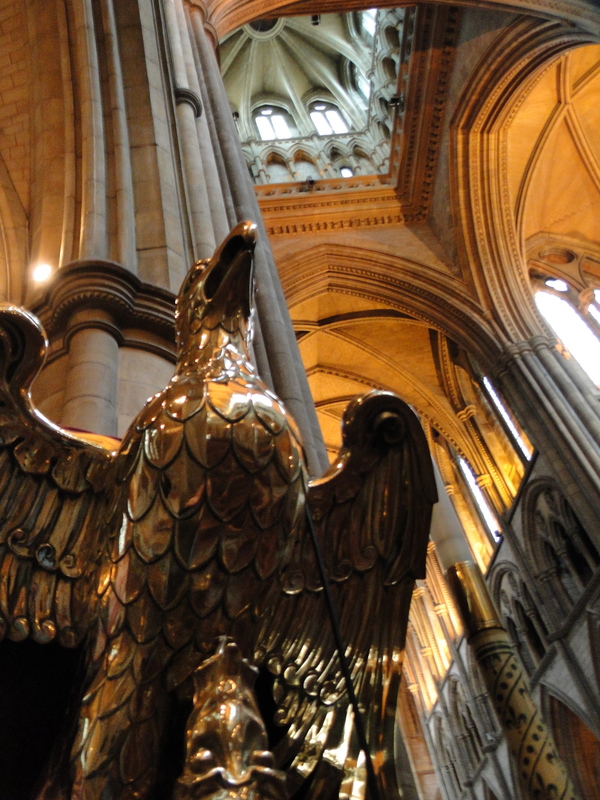 The main Cathedral website is excellent. 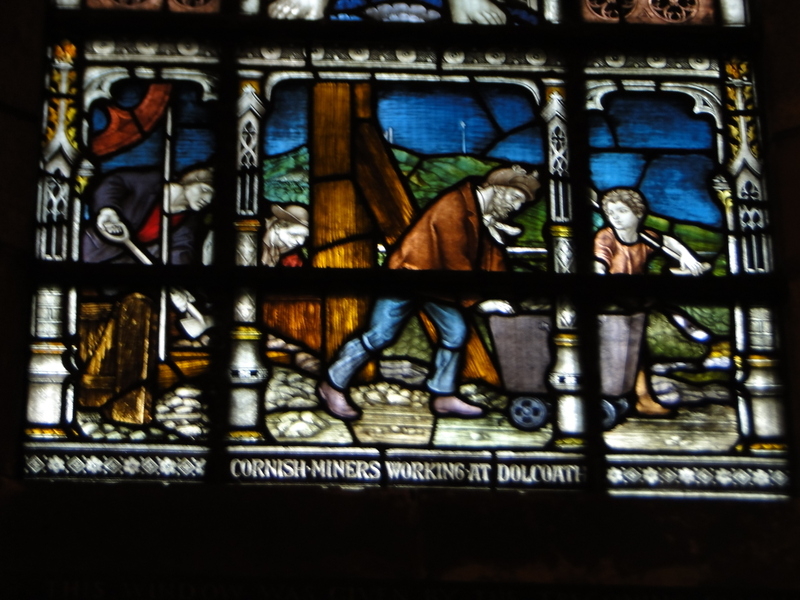 A major restoration and redevelopment programme is underway – see http://www.inspirecornwall.com. Thank you for a lovely bank holiday – if it had been dry we would have missed so much! This entry was posted in Cathedral, Outside Northumberland, Railway interest. Bookmark the permalink.